Previously I’ve been running with Runkeeper, an iPhone app that tracks your runs by GPS. It’s pretty good, but generally under by about .2 mi on any given run. This is probably be due to the poor gps signal in my area and the fact that all current cellphone gps chips don’t work that well. On that note it uses a good chunk of battery power since it has to remain “active” to track. You can now run to music (which i don’t) and setup training routines. Recently I was given a Nike+ sensor to test out. My new 3Gs has Nike+ built in, so I figured I’d take it for a run. I bought a Nathan sensor pocket ($10 at Runaway Success in Paoli, great store, but I digress) to put it on my shoes. It’s a good setup and makes it easy to use the sensor with a non-Nike pair of shoes. In the three runs I’ve fed it, it over calculates by about 5%. This is most likely because I haven’t calibrated it yet and I’m outside the 90% of runners it’s perfect for out of the box (according to Nike). You can run to music, set a power song to kick in when you’re struggling, and set distance, calorie, or time goals for each workout. Since it’s built into the iPhone and iPod touch it runs in the background so it uses less battery power, which is nice. Both seem to work well, but the sites that back them are the differentiator in my mind. 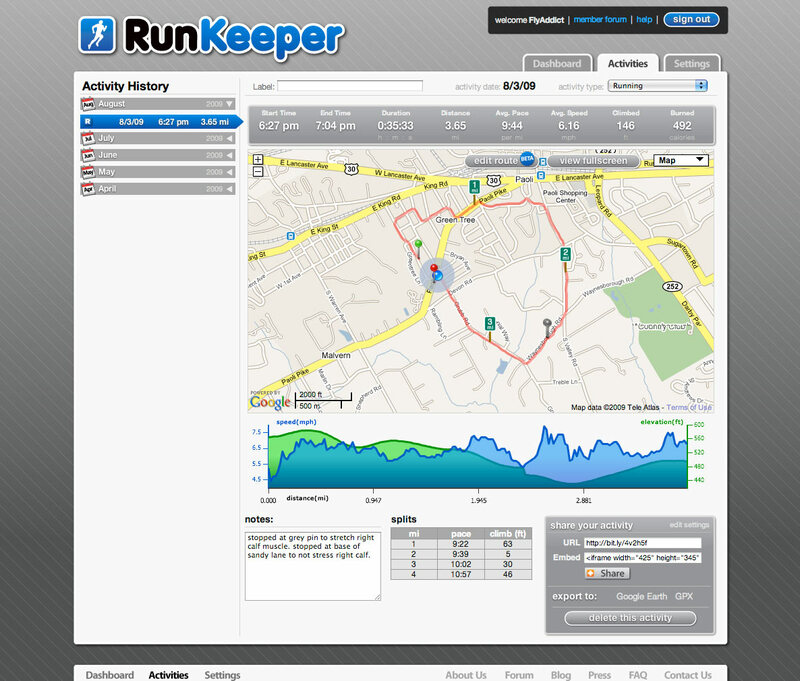 runkeeper.com – recently redesigned in a major overhaul, this site adds a beautiful design and layout to the previous functional version. It shows your progress in a nice ajaxy animated chart, you can sort by the usual things: week, month, year. 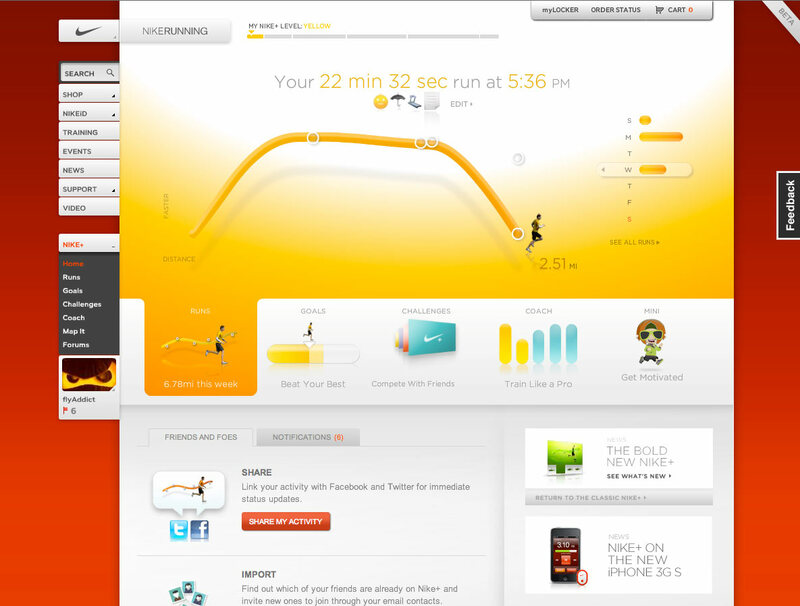 You can also sub-divide your activities into running, walking, cycling, hiking and more which you can’t do with nike+. For any activity you can view a GPS map, with speed and altitude date along a coupled graph. Great information! If your run route is off by a bit (which mine usually are) you can fix your route on the website, only it does mess up your speed data points along the way. Typically I would keep it, trace it out in google earth, and add the real distance and time into Pace. You can share your runs and export your path to google earth which is a nice added bonus. All around 41/2 of 5 stars. nikerunning.com – as you would expect this site is gorgeous, functional, social, and motivating off the bat. You create a profile and set your sharing preferences. You can share on facebook or twitter your runs and much more. Each run is graphed as speed over distance, and extra points are given to the places you hit the home button to find out your stats during your run. It also provides many incentives to run more both from prompting you and subtly encouraging you to set goals to their level coloring system. After 30ish miles you graduate to the next color/level. What that means, I don’t know, but I definitely want to find out! I thought I would miss having the routes tracked with my runs, but you can create routes in their system then assign them to your runs. You can also add their code to your own site (although I can’t seem to find it now after first signing up) to show your nike+ running feed. You can also connect with other users, compete and train all within their site. All around 5 of 5 stars. I’m not a corporate whore: they’ve been at this longer and have more money to throw at it. While I think Nike shoes are underdeveloped and have basically flat soles compared to my new Asics, they sure know how to get you involved, challenge you and have well developed product for tracking your runs. Nike+ is the Google of running apps in my opinion. This entry was posted on Saturday, August 15th, 2009 at 8:30 am and is filed under Blog. You can follow any responses to this entry through the RSS 2.0 feed. You can leave a response, or trackback from your own site.